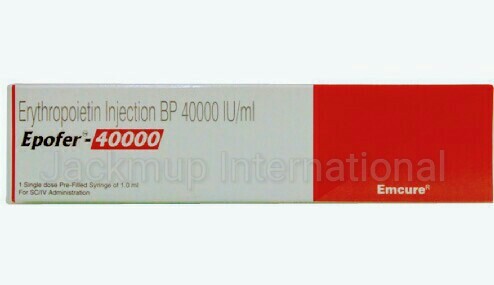 Description:- Epofer 40000iu prefilled syringe is used in the treatment of anemia, anemia due to chemotherapy and anemia due to chronic kidney disease. Epoetin alfa is used for treatment of anemia (low hemoglobin or abnormally reduced number of red blood cells) related to severe kidney disease, cancer chemotherapy for certain tumors or due to zidovudine treatment for HIV (Human immunodeficiency virus) infection. Epoetin alfa is also used in moderately anemic patients scheduled to have major bone surgery (hip or knee replacement surgery) to reduce the need for blood transfusion.